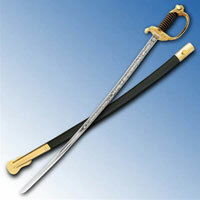 Practical Taiji Tai Chi Swords weigh between 1 pound 5 ounces and 1 pound 7 ounces. 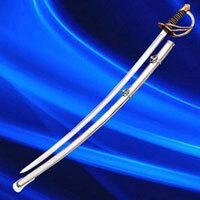 These popular Tai Chi swords feature a traditional Jian straight blade design. 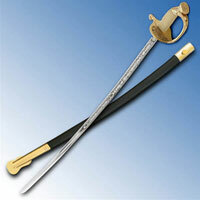 The non edged blade is manufactured in fully tempered 1566 high carbon steel. These well balanced Taiji swords feature a flattened diamond blade section that produces a blade that is moderately stiff while still permitting some flexibility. They have a 6 ½ inch handle and a point of balance at 5, 5.5 and 6 inches depending on the size ordered. 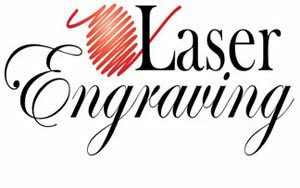 The tip is 0.75 inch wide and 0.11 inch thick. The guard is 1.09 inch wide and 0.21 inch thick. 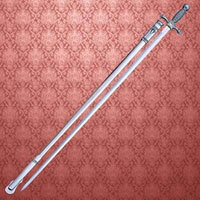 These swords include a quality scabbard that has polished steel fittings. 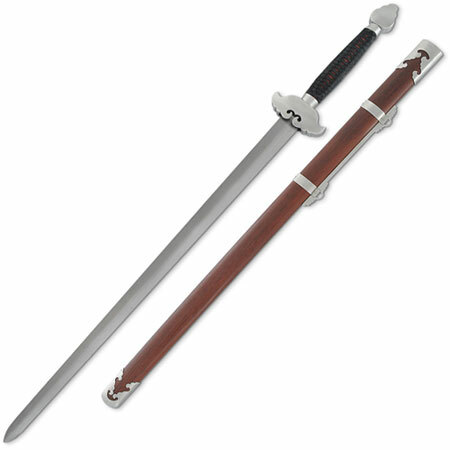 Overall: 34 1/2" | Blade: 28"
Overall: 36 1/2" | Blade: 30"
Overall: 38 1/2" | Blade: 32"
Sparring Jian Swords are 39 ½ inches in all and weigh 2 pounds 2 ounces. 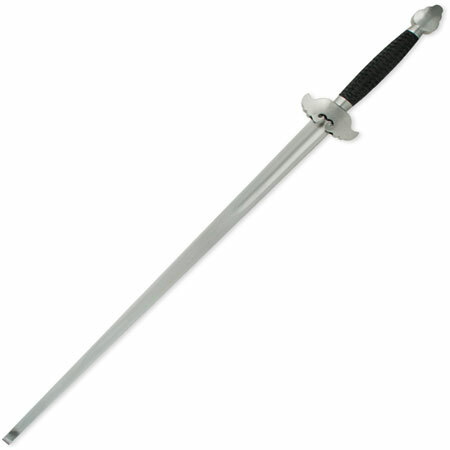 These popular training swords are built for sparring and Chinese martial arts training by featuring rounded edges and blunt steel. Designed by Scott Rodell, the Sparring Jian has a 29 inch 5160 carbon steel blade with a rolled tip and safe blunted edges. They feature a 7 inch handle with a wrapped grip. The point of balance is at 3 ½ inches. Kungfu Jian Swords are made by Dragon King. 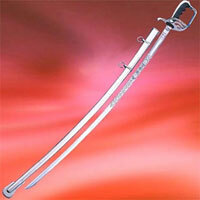 These gorgeous high quality Kungfu Jian Swords have a flexible 28 ½ inch blade. 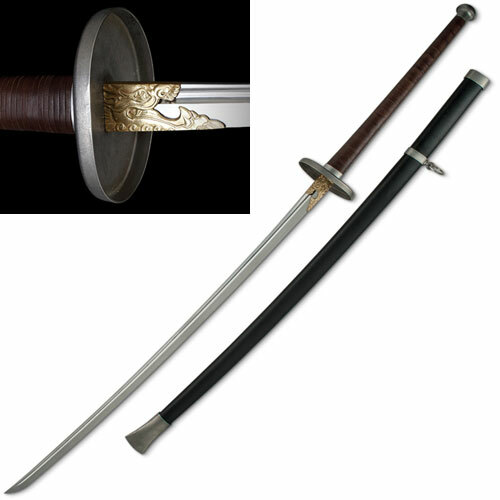 The blade design is similar in shape though thicker than a traditional wushu sword. These functional swords feature a beautiful sunflower and scroll design on the 3Cr13 steel blade with a reinforcing ridge. The 4 ¼ inch composite handle provides an eye-catching contrast against the matte stainless steel guard. 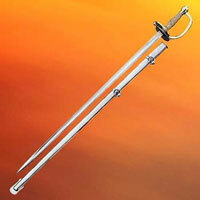 These lightweight Kungfu Jian Swords weigh less than 2 pounds and have the point of balance at the guard. The caramel colored composite scabbard features matte stainless steel accents. 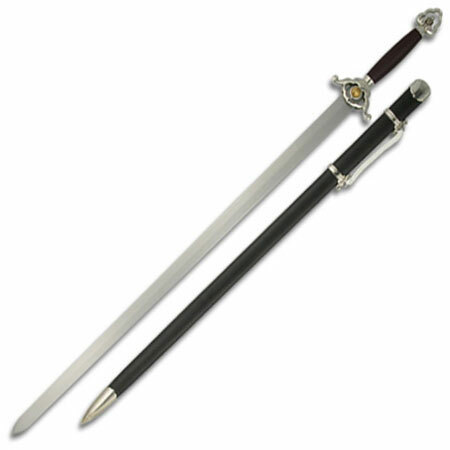 Cutting Jian Swords are 39 ½ inches in all and weigh 2 pound 2 ounces. These traditional Jian Swords are designed by Scott Rodell and feature cutting blade geometry. They have a functional 29 inch 5160 steel blade. They are built using a special steel formulation and heat treatment regimen that optimizes edge hardness of the blade and body toughness. 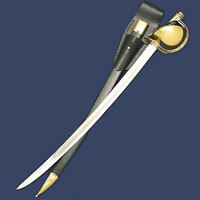 The traditional Jian design includes simple steel fittings. The 8 ½ inch handle features a real black leather grip over cranberry colored ray skin. 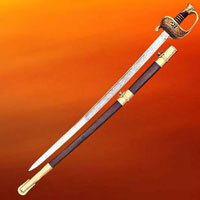 Dragon King Miao Dao Swords are a Chinese long saber that measures an incredible 57 inches in all. Swords like this Miao Dao, or grain leaf saber, were used in the mid-16th Century to combat pirates raiding coastal cities. 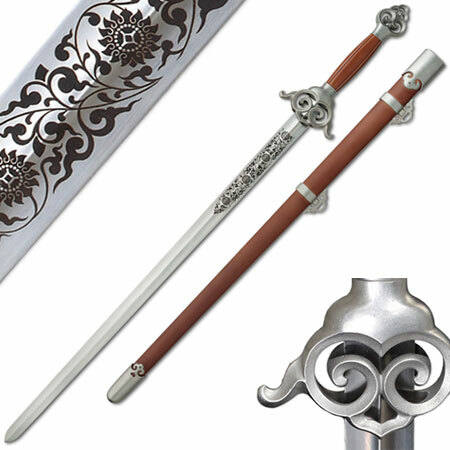 They were by used by the Invincible Qi Army led by General Qi Jiguang and became coveted by soldiers due to the potency and effectiveness of the sword. 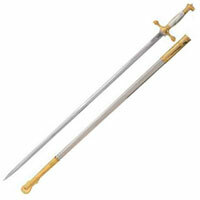 These swords feature a functional, 34 ¾ inch blade made of 5160 high carbon steel. The wooden core, 18 inch handle is traditionally wrapped in leather and accented with a brushed stainless steel pommel and guard. A bronze-colored head of a dragon forms the blade collar which makes the sword appear as though the blade is emerging from the mouth of the dragon. The scabbard has a textured brown lacquer and a brushed stainless steel belt ring, chape and throat. Dragon King Taotie Jian Longswords are 51 ½ inches in all. 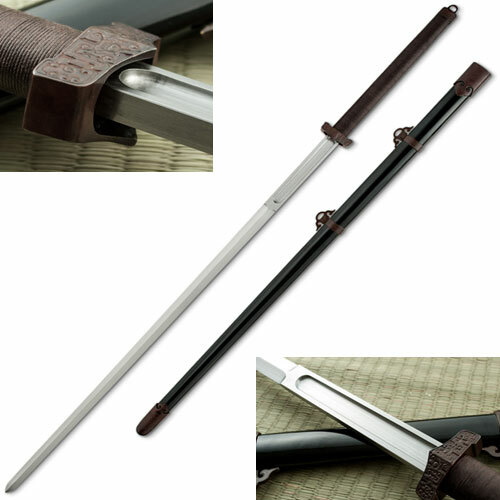 The Taotie Jian Longswords are long Chinese swords that feature a sharp forged 5160 high carbon steel blade. The 37 ¾ inch blade is 3/8th of an inch thick at the base. They have a 7 inch ricasso and a 12 ½ inch handle. The handle features a thin cord wrap. 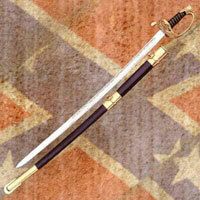 They include a black lacquered wooden scabbard with bronze colored accents. These swords feature Taotie, the Chinese gluttonous monster mask, engraved onto the pommel and guard. Similar to ancient Chinese depictions of Taotie, these swords have the famous raised eyes and classic zoomorphic face. The superbly detailed fittings are crafted from lost wax castings.